Sky, the magazine of Delta Airlines, has as their cover story for March some interviews and photos with some of the folks who work in the West Wing, including the president himself. The photos aren’t much to look at (they’re portraits mostly in the EEOB), but the interviews have some pleasant human interest about the pace, the treasure of small moments, and favorite rooms. Deputy Chief of Staff Mona Sutphen says the Kennedy Garden. Deputy Assistant Danielle Crutchfield says the West Wing corridors, where the photos on the walls change frequently. Photographer Lawrence Jackson says the Palm Room. Director of Online Programs Jesse Lee says the Diplomatic Room. And the president gives a total cop-out answer (where Michelle and the kids are). Former First Lady Barbara Bush has been hospitalized in Texas for tests after feeling ill for some days. Best wishes to her and her family. 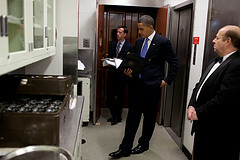 The White House Flickr feed has some more new photos in and around the White House, including some rarely-seen offices. Also, I’ve done another search of the Library of Congress holdings and expect to add a few more vintage photos to the grounds and overview pages. There are some good new pictures on the official Flickr feed, including a terrific one of the president waiting in the Butler’s Pantry to make his entrance to a meeting in the State Dining Room. I’ve change the front page to a picture of JFK, Jr. in the Rose Garden around 1962.